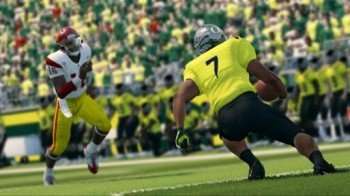 Oregon Ducks running back (and Fiesta Bowl champ) Kenjon Barner, who is looking forward to continuing his football dreams this year with the impending NFL draft, is featured in the new gameplay/producer video for EA Sports’ upcoming NCAA Football 14. One aspect of the game that we’re looking forward to is the acceleration burst feature, which reportedly enable running backs to make more precise cuts and runs once they find a hole to blast through. Fans of the franchise should also be pleased to know that the game will be running on Infinity Engine 2, which will hopefully translate into more dynamic and realistic gameplay. NCAA Football comes out July 9th for the PlayStation 3 and Xbox 360. As for Kenjon Barner, one wonders if the 5’9″ speedster will join coach Chip Kelly on the Philadelphia Eagles.